"... I'm currently using this supp my second day taking it. Wednesday I worked legs and I felt sore as a Mofo cause I haven't had time to workout so that probably why. But my sleep has been great no tossing and turn with these pills I like the out come and would buy these again." "... I am very pleased with the results of just the first night that I have had this product. I bought it on sale at GNC..It was a great night of sleep ..deeep sleeep. It was amazing waking up feeling recovered! " "... I started using this product a cpl weeks ago and have noticed that after a hard workout im not as sore as I use to be. I am 50 and recover def. takes longer now that Im older....its nice to have a product that will speed the recover process along. :)"
"... I seem to be getting a better deeper sleep each night and do feel less groggy in the mornings. It took a couple of weeks for me to start noticing things, but now it's regular. I am always super slow to absorb supplements so that's normal for me. I will say though that I do recovery quicker from workouts and it's most noticeable for leg day where I would usually be sore for about 3 days afterwards, now it's 1, maybe 2." Dramatically Increase Recovery and Muscle Tissue Repair While You Sleep Each Night! 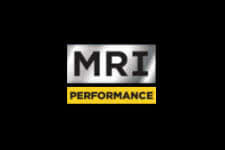 MRI has introduced their first specific muscle recovery formula to the market, Red Repair PM! 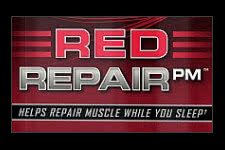 Unlike other sleep-based recovery product on the sports supplement market today, Red Repair PM is specifically designed with key ingredients to make noticeable improvements in your muscle tissue repair progress! The best time, and only time to grow and repair your muscles is when you sleep, which most people are not aware of. When you are in the gym you are actually breaking down the muscles tissue so that it can regenerated bigger and stronger. So this anabolic phase is extremely important and needs to be truly utilized to be effective. Red Repair PM does this very job and does it well. 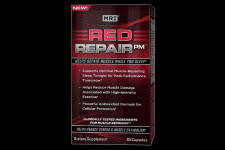 Supporting a deep and relaxed sleep phase while providing your body with the ingredients it requires, Red Repair PM feeds and builds and recovers all night long. Optimize and recharge like never before. Don't Waste Another Night with Lack-Luster Recovery Progress! Extremely effective for High-Intensity Workout Recovery!